Cleanup on the Kalamazoo River in 2010 after a spill. Despite alarms, a leak from an oil pipe went undetected for 17 hours. 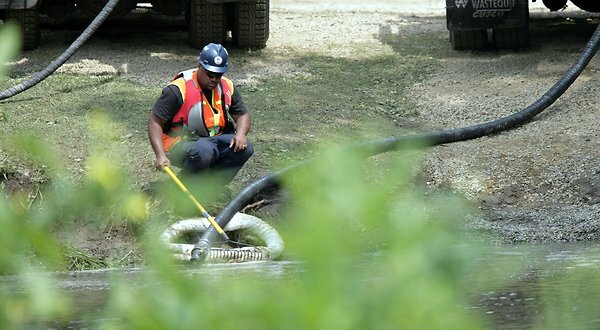 A forthcoming federal report on pipeline safety has found that members of the general public are more likely to identify oil and gas spills than the pipeline companies’ own leak detection systems. The study was commissioned by the Pipeline and Hazardous Materials Safety Administration. Kiefner & Associates, a firm based in Worthington, Ohio, that specializes in pipeline safety, conducted the study by examining pipeline incident reports between Jan. 1, 2010, and July 7 of this year. Its results are currently in draft form and set to be completed early next year. The research was mandated as part of a series of measures passed last year by Congress intended to make oil and gas pipelines safer. “It has been clear for years that these computerized leak-detection systems don’t work,” said Carl Weimer, executive director of the Pipeline Safety Trust and a member of the pipeline agency’s hazardous liquid technical advisory committee, which has reviewed the draft report. “The question for me is why have regulators continued to allow the pipeline industry to keep selling the public on leak detection systems that don’t work as advertised? For the first time ever, the US has the ability to become a major exporter of natural gas, courtesy of the fracking boom. Scientists, doctors, environmentalists and former industry insiders, however, are demanding time for researchers to first consider the potential impacts to local communities. A former high-ranking Mobile Oil executive has joined more than 100 scientific and medical professionals in urging the Obama administration not to approve several proposed liquefied natural gas exporting facilitates that would expand the domestic demand for natural gas produced by the controversial, high-volume gas drilling technique known as "fracking." The development of the massive natural gas export facilities would require a "rapid increase" in fracking operations, which have been linked to water, air and soil pollution as well as health problems in communities near the drilling rigs, according to a petition filed with the White House last week by Physicians, Scientists and Engineers for Health Energy (PSE). The scientists and medical professionals warn against creating international demand for gas produced by the already rapidly expanding fracking industry, without first conducting widespread environmental and health impact studies to ensure the American public is safe. "The question here is very simple. Why would the United States dramatically increase the use of an energy extraction method without first ensuring that the trade-off is not the health of Americans in exchange for the energy demands of foreign nations?" said Seth B. Shonkoff, PSE director and environmental researcher at the University of California at Berkeley. Environmentalists - and even industry insiders like Allstadt - say the full scope of potential environmental and health impacts of unconventional fracking remains unknown, but anecdotal evidence from across the country continues to suggest that fracking can contaminate groundwater and cause health problems in nearby communities. "Researchers are finding measurable levels of pollutants from this industry in air and water that are associated with the risk of illness," said Adam Law, a PSE member and physician at the Cayuga Medical Center in Ithaca, New York. "The first studies to describe this are entering the scientific literature, and public health researchers are embarking on multiple approaches to study the associated adverse health effects." Law said policymakers should wait for such research to be completed before approving export facilities that would cause a rapidly expanding industry to grow even faster. Fracking is common in medically underserved areas, he said, and rural communities do not stand to benefit directly or indirectly from expanding international export markets. "In fact, for them, natural gas prices will only go up, and they will be left living with not only the stresses of the industrialization on their rural communities, but also with the legitimate concern that they will have to pay the price with their own physical health," Law said. Another issue that must be addressed, according to PSE members, is the disposal of the massive volumes of wastewater created by fracking, which can contain fracking chemicals and underground brines laced with heavy and even radioactive metals. Underground fracking wastewater disposal wells in Ohio and Arkansas have been linked to outbreaks of minor earthquakes, and groundwater contamination continues to be a concern among environmentalists. Shell Canada announced that the company will immediately abandon plans to frack for natural gas in an area of British Columbia known as the Sacred Headwaters on Tahltan Nationtraditional territory. The province of BC says it will issue a permanent moratorium on oil and gas tenures in the area. A four-year moratorium, scheduled to expire today, began after Shell drilled three test wells in the area, igniting protest and blockades throughout the region and at Royal Dutch Shell headquarters in The Hague. In 2004, Shell was awarded a 400,000 hectare tenure in the Sacred Headwaters, the point of origin of the Skeena, the Nass and the Stikine rivers which are among the province's most important salmon-bearing waterways. According to the Skeena Watershed Conservation Coalition, Shell's plans involved the construction of nearly 300 kilometers of road and over 4000 wells, as well as pipeline infrastructure and compressor stations. In a separate agreement, BC will award Shell $20-million in royalty credits, as compensation for the lost tenure. The funds will be redirected toward a water recycling project at Shell's gas drilling operations elsewhere in the province. “Shell has backed away from a project only a handful of times. The powerful, relentless movement led by the courageous Tahltan and supported by nearly 100,000 people from around the world has not only stopped Shell, but persuaded the BC government to permanently protect the region from any further gas development,” said Karen Tam Wu, ForestEthics Advocacy senior conservation campaigner. According to a BC government news release, the region is considered culturally, spiritually and socially significant to the Tahltan Nations. "The government of British Columbia would like to thank the Tahltan Central Council and Shell for their commitment to positive communications during the last few years. Together, we have put agreements in place that respect the interest of all three major parties and have tangible benefits for British Columbians," said Rich Coleman, BC's Minister of Energy, Mines and Natural Gas. Annita McPhee, president of the Tahltan Central Council, said the band wanted to acknowledge Shell's decision. "The Klappan is one of the most sacred and important areas for our people...Our people do not want to see it developed, and we look forward to working with BC on achieving permanent protection of the Klappan." According to the Globe and Mail, the BC government may extend protections in the area by restricting mining activities as well, something Sacred Headwaters campaigners have hoped for in their ongoing fight against Fortune Minerals. PANAMA, NY - New York State's cautious approach to permitting hydraulic fracturing of the Marcellus shale for natural gas, and the disposal of potentially hazardous waste from such operations, is of little comfort to residents of this Chautauqua County community. That's because they find themselves living next door to a soon to be operational waste disposal facility built literally a few feet over the state line in Columbus Township, Pennsylvania. After years of an exhaustive permitting process, the federalEnvironmental Protection Agency has granted a permit for Bear Lake Properties LLC to begin trucking in fracking fluids to a transfer station at the corner of Weeks Road and State Line Road. The fluids, once off loaded, will then be pumped through an underground pipeline a few feet below the surface, traveling approximately one mile to two no longer producing gas wells. The waste will then be infused back down the wells and into the rock about a mile below the surface for its ultimate disposal. One of the wells is about 100 yards from the NY/Pennsylvania state line. "This is the wrong place for this kind of project," said Bill Peiffer, a Warren County PA resident who has been fighting the project for years, while noting that there are homes directly across the road from the transfer station, which have wells upon which the occupants rely on for water. Peiffer has also been assisting New York residents in marshalling opposition . "My worst fear is it's going to contaminate the water wells," said Mary Ellen Sykes, who with her husband Joseph lives on a 300 acre spread two miles away from the transfer station. "What's gonna happen if they contaminate the water? ....we're done forever," Sykes said. The West Virginia gas pipeline explosion follows several high profile natural gas accidents and a rapid increase nationally in pipeline mileage – even as federal oversight appears to lag. A fireball is seen across Interstate 77 in Sissonville, West Virginia in this aerial photo from December 11. A natural gas pipeline exploded in flames near Charleston, West Virginia, on Tuesday, setting nearby buildings on fire and injuring several people, authorities said. The fireball explosion Tuesday of an interstate natural gas transmission line in West Virginia, which left behind a huge jet of flame that burned for more an hour and melted four lanes of I-77, is just one of scores of accidents and explosions involving natural gas lines this year, federal data show. Despite the magnitude of the explosion and fire, preliminary reports were that all persons were accounted for with no injuries, said a member of theNational Transportation Safety Board, which is charged by Congress with investigating pipeline as well as airline, railroad and other transportation accidents. An NTSB team was in Sissonville, W.V. at first light Wednesday, examining evidence at the accident site. Robert Sumwalt, a safety board member, told reporters at an initial press briefing late Tuesday that the NTSB team would not speculate on causes of the explosion, but would collect evidence and interview witnesses, including the operators of the pipeline, Columbia GasTransmission company, a subsidiary of Houston-basedNiSource Gas Transmission and Storage. But whatever cause eventually emerges, the dramatic event in Sissonville is set against a backdrop of several high profile natural gas accidents and a rapid increase nationally in gas pipeline mileage – even as federal oversight appears to lag. "There are never enough inspectors at the state or federal level to adequately cover all the pipelines," says Rebecca Craven, program director at the Pipeline Safety Trust, a watchdog group based in Bellingham, Wash., that monitors energy pipelines of all types. "They can't physically spend enough time with each operator or pipeline to be able to do a thorough job and conduct regular inspections. They do what they can ­– enough to comply with their requirements." A subsidiary of Nabors Industries Ltd. (NBR) pumped a mixture of chemicals identified only as “EXP- F0173-11” into a half-dozen oil wells in rural Karnes County, Texas, in July. Few people outside Nabors, the largest onshore drilling contractor by revenue, know exactly what’s in that blend. This much is clear: One ingredient, an unidentified solvent, can cause damage to the kidney and liver, according to safetyinformation about the product that Michigan state regulators have on file. A year-old Texas law that requires drillers to disclose chemicals they pump underground during hydraulic fracturing, or “fracking,” was powerless to compel transparency for EXP- F0173-11. The solvent and several other ingredients in the product are considered a trade secret by Superior Well Services, the Nabors subsidiary. That means they’re exempt from disclosure. Trade-secret exemptions block information on more than five ingredients for every well in Texas. Drilling companies in Texas, the biggest oil-and-natural gas producing state, claimed similar exemptions about 19,000 times this year through August, according to their chemical- disclosure reports. Data from the documents were compiled by Pivot Upstream Group, a Houston-based firm that studies theenergy industry, and analyzed by Bloomberg News. Nationwide, companies withheld one out of every five chemicals they used in fracking, a separate examination of a broader database shows. Trade-secret exemptions block information on more than five ingredients for every well in Texas, undermining the statute’s purpose of informing people about chemicals that are hauled through their communities and injected thousands of feet beneath their homes and farms, said Lon Burnam, a Democratic state representative and a co-author of the law.